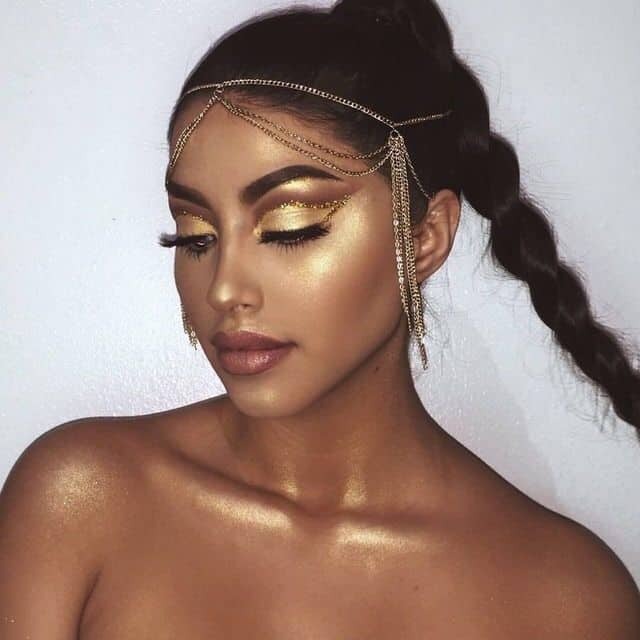 There’s no better way to compliment your tanned, sun-kissed skin than with some glowing bronze makeup. When you start feeling the toasty warmth of summer, you know it’s time to bring out your bronzers. Since it’s everyone’s favorite, we’ve found a few ways you can incorporate the color bronze into your makeup look as the main character. Here is our list of 7 ideas for bronze makeup looks to rock this summer. Following are the 7 chic and trendy bronze makeup looks for women. Check out the ideas and draw inspiration for your next summer look. Brighten up your plain look by accompanying your bronzer with a bright pop of color. Ideal for: This dazzling bronze makeup look will be ideal for your prom night. How to: Start off by decorating your eyes with a deep bronze and sparkling rose gold eye makeup, then swipe a bright teal eyeshadow look on your lower lash line. Finish off with a mauve lip gloss. Nothing screams the 90s like a sparkling shade of bronze makeup & bold lipstick. Ideal for: This bold look is ideal for a night out at a club. 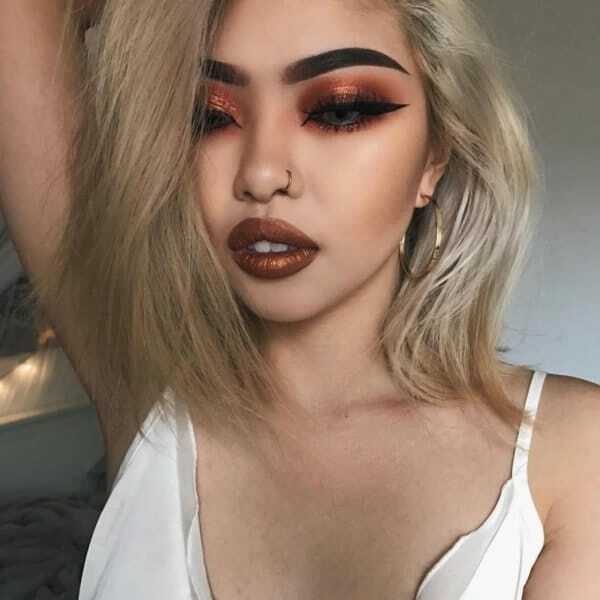 How to: Glam up your eyes with a sparkling copper shade and dramatic winged eyeliner, then paint your lips with a metallic bronze eye makeup and lipstick to make a statement. There’s no better way to describe the term timeless pairing than bronze makeup on eyes and red lipstick. Ideal for: This classic look is ideal for a date night. How to: Illuminate your eyes with glittery bronze eyeshadow and minimalistic winged eyeliner. Finish the look off with a bright shade of red painted on your lips. There’s no better way to glam up your tanned skin than with a champagne shade. Ideal for: This ethereal makeup look with bronze shade is ideal for a brunch, work, or even school. How to: Start off by going about your usual makeup routine, then enhance your features by brushing over some Luminizing Bronzer by Catrice Cosmetics. Who said you couldn’t make a statement with just bronzer? Ideal for: This warm bronze eye makeup look is ideal for a beach party. How to: All you need to do is apply bronzer under your cheekbones, on your forehead, nose, jawline, and above your lips. A touch of bronzer combined with highlighter equals picture perfection. Ideal for: This delicate look is ideal makeup for wedding. How to: Apply a sober shade of brown on your eyes and a pinkish mauve shade on your lips. Then brush over some bronzer on your cheekbones, forehead, nose, and chin. Swipe on some highlighter and you’re done with your bronze makeup. We learned it from the Kardashians. Ideal for: This defined bronze makeup look is ideal for Fashion Week. How to: Adorn your eye with a glowing shade of golden and apply a dark bronzer under your cheekbones, on the sides of your nose, and your jawline. There you have it. Most flattering bronze makeup ideas for women for the coming summer.